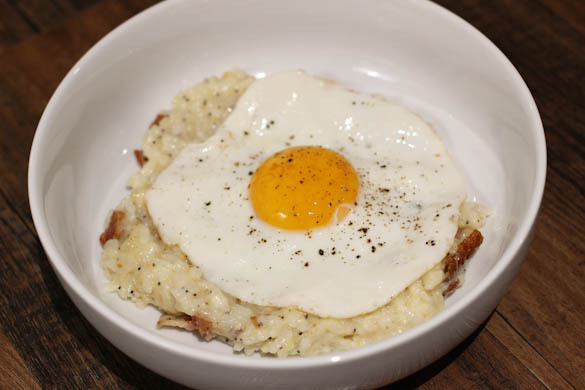 I made risotto the other night with bacon, white cheddar, everything bagel seasoning and topped it with a fried egg and I cannot be more excited about it. I made it back in 2014, according to instagram, but didn’t blog it since I didn’t make it up. I am now realizing this was the genius idea of We Are Not Martha! Hers is bea-u-ti-ful with a lovely poached egg! There are about 10,000,000 variations on pinterest too! I knew mine had to be all about the Everything Bagel Seasoning! 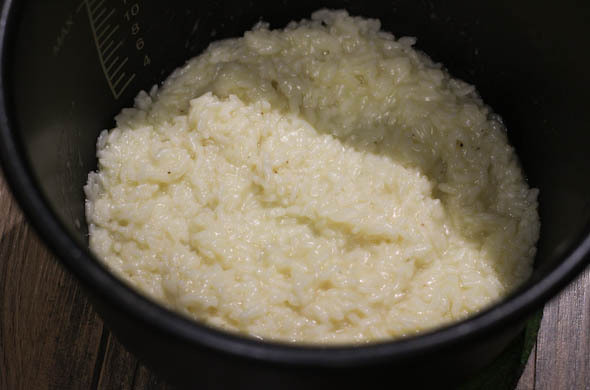 It is so delicious prepared as risotto- maybe because the sticky rice seems like oatmeal texture? The everything bagel seasoning MAKES this. Do not skip it! I make my own or I’ve heard it is at every grocery store now. At first I gave the little one avocado instead of an egg but he ate so much of my egg that we made him his own and he ate it all. Eggs can be hit or miss so I love whenever he eats it up! Prepare the risotto according to the package. Mine went into the pressure cooker for 6 minutes. 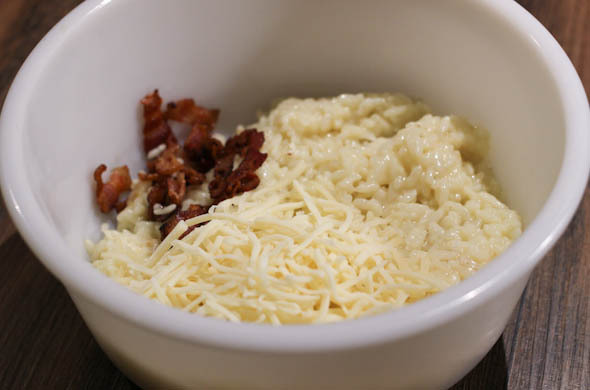 When the risotto is cooked, add in the cheese, bacon, and about 3/4 of the everything bagel seasoning. Gently stir to incorporate without breaking the bacon too much. 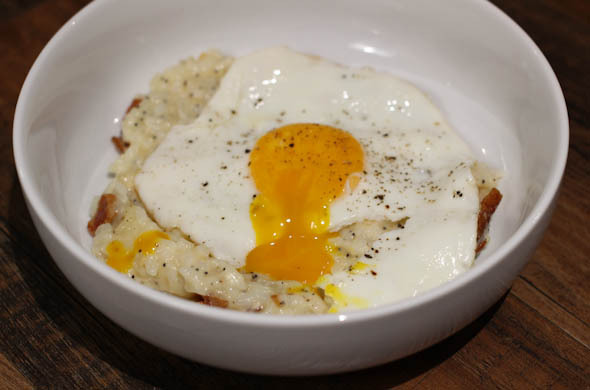 Fry the eggs and serve on top of the risotto. Top with additional everything bagel seasoning! This was dinner and was ohh, so, delicious. I took leftovers as lunch the next day with a hard boiled egg. I added tons more Everything Bagel Seasoning and after I warmed the risotto (not the egg – ewww – weird) I dumped some grape tomatoes with a drizzle of Italian dressing on top of my leftovers too. The cool and acidic tomatoes with the warm decadent risotto were fantastic. 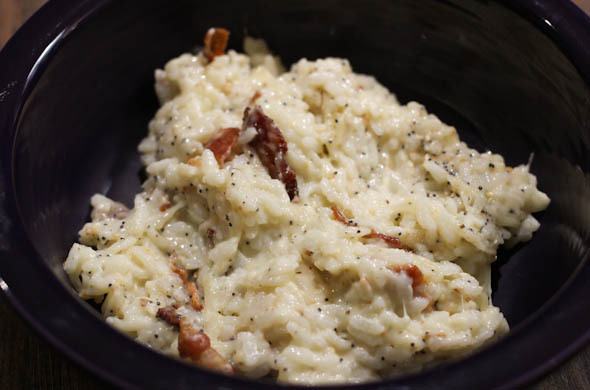 Risotto is the best, though tricky for a crowd. It seems like the perfect meal for 1 if you halve it! Or you could turn leftover rice into this to revamp some leftovers! I’ve made the same general idea swapping arborio rice for other grains, like as a farro bowl.